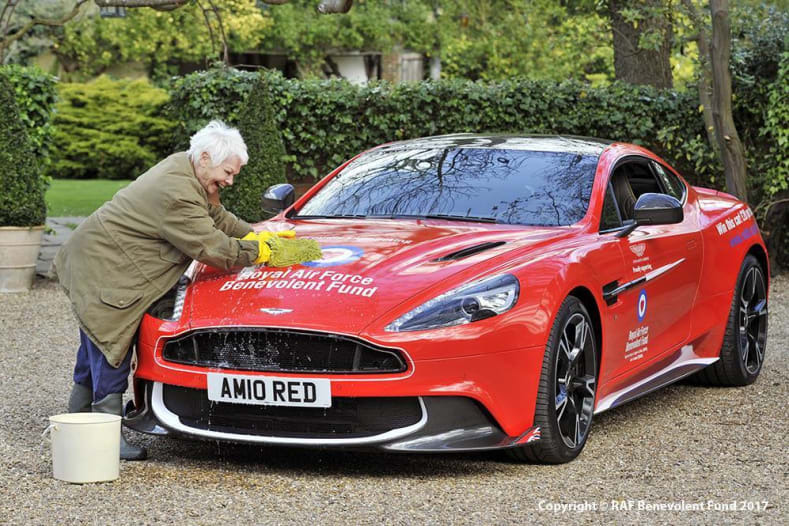 Aston Martin Cambridge has donated one of the ten limited edition cars, Red 10, to the RAF Benevolent Fund who will raffle it off with all funds going directly to the charity supporting RAF personnel past and present and their families. 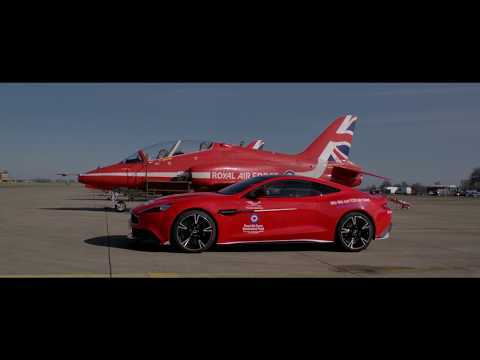 To honour the commitment of RAF personnel past and present, Aston Martin Cambridge has created a spectacular series of special Vanquish S project cars based on the Red Arrows Hawk jets. Officially launched at St Athan, the Aston Martin Vanquish S Red Arrows is the third car in Aston Martin Cambridge’s aviation series. 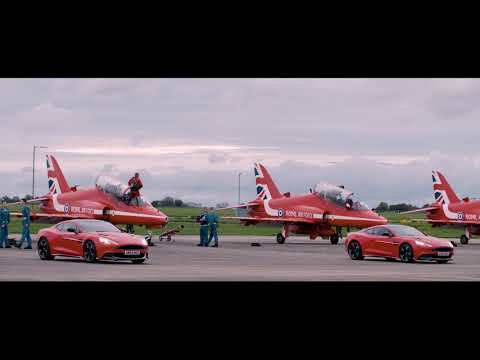 RAF Red Arrows pilot, Mike Bowden, provides an insight into what makes the Red Arrows so special while introducing the Aston Martin Vanquish S Red Arrows car. Hear the story from the perspective of a Red Arrows pilot. Group Captain, Mike Neville, introduces #AstonRed10 and tells the story of the RAF Benevolent Fund encapsulating the scope of support provided to serving and former RAF personnel. Simon Lane, General Manager of Aston Martin Cambridge, uncovers the journey behind the Aston Martin Vanquish S Red Arrows project and the donation of #AstonRed10. Each owner and a chosen guest were invited to Aston Martin Gaydon on the 12th July to see their car on the production line and a guided tour of the factory. Owners also met the Aston Martin design team who were briefed on the Vanquish S Red Arrows project as well as meeting the other owners prior to the handover event. The day was finished with a Q&A session with a Red Arrows pilot. The Aston Martin Vanquish S Red Arrows raffle car - Red10 - has got a busy summer ahead of it. The car will be at a number of high profile venues throughout the summer including Torbay air show, Goodwood Festival of Speed, Sunderland air show, Eastbourne air show, Bournemouth air show, Southampton boat show - please see the full list of venues below. "I’m a huge fan of what the RAF Benevolent Fund does to provide vital help to past and present members of the RAF and their families," said Dame Judi. "When they asked me to support this raffle, I just couldn’t say no. The lucky winner of this Aston Martin Vanquish S Red Arrows prize will certainly have a licence to thrill. I’ll definitely be buying a raffle ticket or two..."
Jodie Kidd has teamed up with the RAF Benevolent Fund, the RAF’s leading welfare charity, to support its exciting raffle where one lucky winner will drive away with a rare Aston Martin Cambridge Vanquish S Red Arrows Limited Edition car. The owners of the strictly limited, Aston Martin Vanquish S Red Arrows edition, received the keys to their highly prized new sports cars at a memorable and exhilarating handover day at the display team’s home of RAF Scampton, Lincolnshire on October 24th. The new owners and VIP guests gathered at the home of the Red Arrows at RAF Scampton for the formal unveiling. The day also featured a number of breath-taking activities, including a spectacular Red Arrows flypast over the airfield, the chance to take to the skies in a Blades display aircraft. Guests could also experience a Red Arrows pilot briefing, take a flight in a privately-owned R44 or King Air helicopter, and enjoy talks by the President and Chief Executive Officer of Aston Martin, Dr Andy Palmer, the Chief of the Air Staff, Air Chief Marshal Sir Stephen Hillier KCB, CBE, DFC, and Red 1, Squadron Leader David Montenegro. Finally, all the car owners were invited to pose for a unique and memorable photo opportunity as each of the Aston Martin Vanquish S Red Arrows edition cars were positioned next to the individual jet that its customised design was based upon. The attention to detail within each car is truly astounding. Internally, the Vanquish S Red Arrows edition boasts specially designed features including the ‘Diamond Nine’ embroidery on headrests; obsidian black with olive green inserts matching ejection seat fabric colours in the Red Arrows Hawk; audio on/off system switch made from recycled Red Arrows Hawks parts; Hawk serial number embroidery on passenger airbag matching aircraft and Red Arrows squadron crest lacquered into the screen veneer in a monochrome finish. Simon Lane, Dealer Principal at Aston Martin Cambridge, comments: “The Aston Martin Vanquish S Red Arrows edition is a stunning example of what can be achieved through Q by Aston Martin. 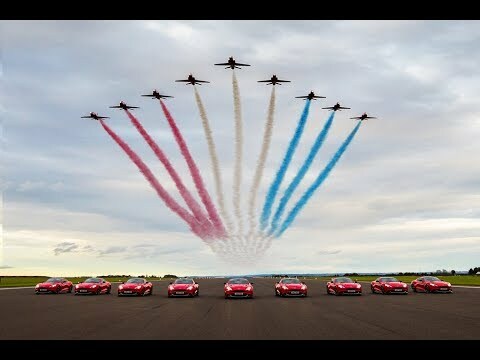 By collaborating to bring Aston Martin and the Red Arrows together in this unique way, we feel it is a fitting tribute to the very best of British achievement and engineering prowess. Each of the cars is a stunning example of automotive excellence and design aspiration and will offer their owners a truly unique motoring experience in the years to come. Squadron Leader David Montenegro, Team Leader of the Royal Air Force Aerobatic Team, and Red 1 in 2017, said: “The Red Arrows represent the best of British, not just in the air with precision flying but also in our teamwork and engineering excellence on the ground. “These qualities of innovation and creativity are naturally shared with Aston Martin and can been seen with this one-off car. The Red 10 car is being raffled by the RAF Benevolent Fund, which supports RAF personnel past and present and their families. The charity will be raising much needed funds in its support of the RAF Family. To be in with a chance of winning, visit https://www.rafbf.org/red10 or search for #AstonRed10. Humphrey Bradley, the lucky winner of Red 10, picked up the keys from Dealer Principal Simon Lane, Squadron Leader Adam Collins (aka Red 10) and members of the Red Arrows engineering team. ​All activities subject to operational restrictions.